This musical instrument simulator allows hard-rocking gamers to put their air-guitar skills to good use. Guitar Hero is played with a guitar-shaped controller that features five fret buttons, a strum sensor, and a working whammy bar. Gamers can jam along with more than 30 classic and contemporary songs, including numbers by the Ramones, Ozzy Osbourne, White Zombie, and Franz Ferdinand. Success involves both synchronization and style. The game's story mode progresses through six different venues, from the makeshift basement studio to the sold-old stadium concert. When playing through Career mode or in other parts of the Guitar Hero games, the player has the option to select one of several pre-created avatar characters, who will be shown performing on stage as the player attempts a song, but otherwise has no effect on the gameplay. A certain number of characters are available at the start of the game, but the player must spend in-game money earned by successful performances to unlock other characters. Many of the characters reappear throughout the series, though some games feature a smaller number of characters. Games that feature caricatures of celebrity artists, such as Guitar Hero III and Guitar Hero: Aerosmith, include the ability to unlock those artists as playable characters. Guitar Hero World Tour includes the ability for players to create their own characters. It is the second installment in the Guitar Hero series and is the sequel to Guitar Hero. It was first released for the PlayStation 2 in November 2006 and then for the Xbox 360 in April 2007, with additional content not originally in the PlayStation 2 version. The player uses a guitar-shaped peripheral to simulate the playing of rock music as notes scroll towards the player.The game features more than 40 popular licensed songs, many of them cover versions recorded for the game, spanning five decades (from the 1960s to the 2000s). In Career mode, players create a band name and select a guitarist from among the available characters. 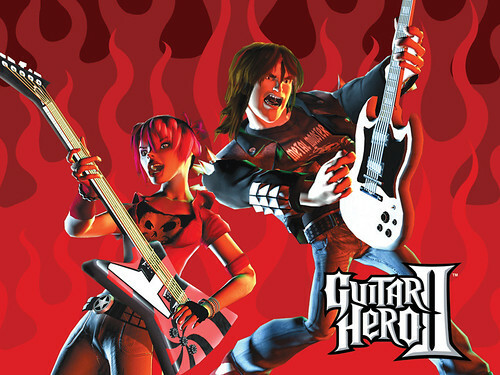 Eight characters, each representing a unique genre of rock music - are available from the start of the game: Eddie Knox, Axel Steel, Casey Lynch, Lars Ümlaüt, Izzy Sparks, Judy Nails, Johnny Napalm, and Pandora. Additional characters — Clive Winston, Xavier Stone and the Grim Ripper — can also be purchased, allowing them to be used in later sessions. Only the lead guitar is available to be played in the Career mode. Over the course of the Career mode the band plays at eight available venues. The venue system from the original game has been altered slightly and has the band traveling geographically from town to town in order to play at the next arena. The venues are Nilbog High School, The Rat Cellar Pub, The Blackout Bar, The RedOctane Club, the Rock City Theater, the Vans Warped Tour, Harmonix Arena and Stonehenge. The venues feature lighting and pyrotechnics that are synchronized with the music. Not all songs in the main set list are available from the start. Once a song is unlocked for play within Career mode, it becomes available for play in all other modes. When working through Career mode at a specific difficulty level, the next tier of songs is unlocked once the required number of songs on the current tier (3-5, depending on difficulty and console) are completed. Additionally, the encore song for a particular tier is only made available once its requirements are completed. On the Easy difficulty setting, there are no encores available, but the next tier will be unlocked immediately after completing the required songs in the previous tier. Successful completion of a song on Medium or higher difficulty during Career mode will earn the player in-game cash. Higher difficulty levels and better scoring performances are rewarded with more cash. In-game money can be used at The Store to buy various items. Some items are available only after completing all songs at higher difficulty levels or 5-star performances. Within The Store, the player can purchase new Gibson guitars, guitar finishes, three additional characters, alternate outfits for the eight characters available from the start, bonus songs, and videos. For unknown reasons, the bonus videos are absent from the PAL version of the game. Within the Xbox 360 version, there is also an option to access the Guitar Hero II content on the Xbox Live Marketplace.